Ballerina Stakes 2014; Nine Salty Senoritas Ready For A Dance-Off At The Spa: The 36th running of 2014 Ballerina Stakes takes place Saturday, August 23, 2014 at Saratoga Race Course in Saratoga Springs, New York. The race is named after Howell E. Jackson’s filly Ballerina, who won the 1954 inaugural Maskette Stakes, as it was then titled, before they changed the name in 1979. This (GI) race is for fillies and mares 3 years-old and up running 7-furlongs on the dirt with a purse of $500,000. Artemis Agrotera and jockey Rajiv Maragh team up for the Ballerina Stakes at Saratoga on Saturday, August 23, 2014 with 5-1 morning line odds. The most wins by a trainer are C.R. McGaughey III in 1984, 1988, 1991, 1994 and 1999. The Ballerina Stakes has been won twice by the filly Shine Again in 2001 and 2002. Last year the race was won by the now retired Dance to Bristol for Ollie L. Figgins III. The 2014 Ballerina Stakes is a Breeders’ Cup Challenge race with a “Win and You’re In” for a paid berth in the Filly & Mare Sprint. We have a loaded field of nine ready to take on the “Spa” for a start in the gate at Santa Anita. The 2014 Ballerina Stakes has a start time of 5:08 pm EST and is the 11th race of the day on quite a card. It’s the third leg of the $1 million Guaranteed All Stakes Pick 4, that includes the (GII) $250,000 Ballston Spa; the (GI) $500,000 Ketel One King’s Bishop; and concludes with the 145th running of the (GI) Travers Stakes. 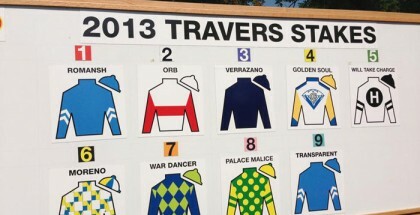 Both the Ballerina and the Travers will be shown live on NBC as part of the “Summer at Saratoga Breeders’ Cup Challenge Series” beginning at 4:30 pm. It looks like Better Lucky & My Miss Aurelia are ready to lock hoofs again in their rivalry Saturday after Better Lucky mowed them all down last out in the Shine Again. However, my eye has drifted elsewhere. This is one tough field with some super fast gals. So let’s get started with Sigi and I’s top picks. My top pick to win this race is the Bruce Levine trained daughter of Bustin Stones (City Zip) Hot Stones. It’s back to sprinting for the 4 year-old who recently worked a nice 4F breeze in 48.72, which was her second work after finishing 3rd last out in the Shuvee (GIII) on July 27th going 1 1/8 miles. She’ll be cutting back in distance here and I like her draw of post #8 with hot jockey Irad Ortiz in the irons. 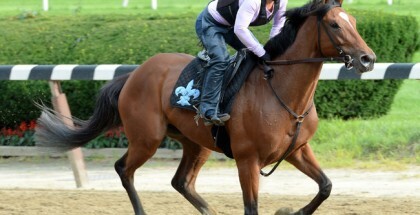 She won the (GII) Bed o’ Roses at Belmont last July which was her only try at 7F. She broke her maiden last year at Saratoga and has two third place finishes on this track as well. 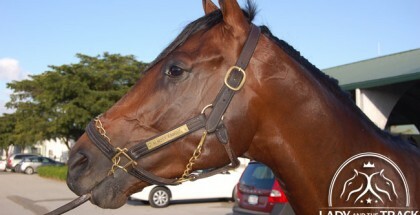 Hot Stones looks ready to bring her A-game Saturday. I’m also really digging the 3 year-old Michael Hushion trained Artemis Agrotera who is coming in for her 3rd race off the layoff after finishing 5th last fall in the Breeders’ Cup Juvenile Fillies (GI). She recently romped in a 10 1/4 length allowance/optional claiming race at 7F July 23rd on this track earning a 104 speed figure. At the age of two she captured the (GI) Frizette so she has the class. Her first start this year she finished 8th in the Acorn Stakes (GI) at Belmont July 7th, which was a little surprising to me. She seems fit, back in her old form and ready to roll. She’ll be riding from the rail with Rajiv Maragh in the irons for the first time. The 4 year-old daughter of Yes It’s True speedball La Verdad for Linda Rice recently came off a 5th place loss in the Honorable Miss (GII) on this track going 6F on July 28th. That was a tough race as she was stuck on the rail over a sloppy track. She has a recent 4F work in :47.4 and I like her to hit the board here but I’m not too sure about a win. Prior she was on a four-race win streak, mind you all stakes races, including the (GII) Aqueduct Distaff Handicap. La Verdad has won at a mile at Belmont and has a second going 7F in the (GII) Fritchie last winter. This fast 6F bomb gets J. Ortiz up leaving gate #6 and we’ll see how far she wants to take them. With La Verdad gunning to lead the way, Artemis Agrotera is likely to show some speed from the rail and I think they will both hit the board. I’ll be looking for Hot Stones to hopefully sit in the garden-spot and win. Better Lucky & My Miss Aurelia are going to be tough to beat and I hope to do it. Artemis Agrotera returned on July 23, 2014 winning gate-to-wire by 10 lengths very easily. That was a superb effort and it looks like this filly has resumed her 2-year-old fitness level. Remember, she was one of the Breeders’ Cup juvenile filly favorites. She’s working very well, so I’m using her as a single. My play will be a Daily Double starting in Race #10: 2,3,5/1. Thanks Sigi for adding your picks and plays. Safe ride to all Saturday.